For most women, buying shoes or nail polish is the go-to retail addiction. For me, it’s Lush Cosmetics. I’m seriously hooked. Every time I walk into the store, I’m sniffing all of the products like an over-excited puppy. Something about the all-natural ingredients and rich scents makes me feel about a million times fancier than I really am. 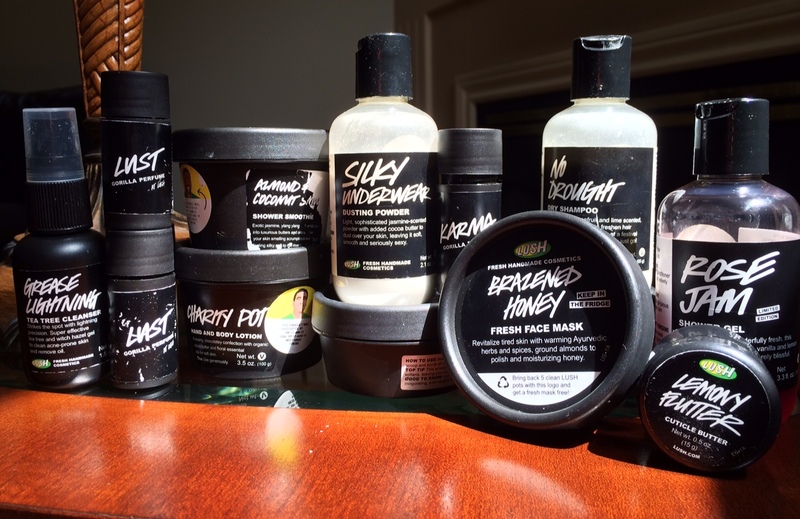 I’ve sampled products from each of their ranges except makeup and bath bombs. I know, I know. How can I proclaim myself a Lush fanatic if I’ve yet to use their bath bombs? Truth is, the concept of baths grosses me out a little. I just don’t understand how soaking in a pool of your own filth can help you get clean. Not to mention spending $7 on a bath bomb that you’ll only use once is kind of upsetting. As far as dry shampoos go, I didn’t have the highest hopes for this one. I was worried the loose powder would make a mess and be harder to blend into my dark hair. Unfortunately, it proved me right. The powder goes everywhere and rather than staying loose, it clumps into small balls. Blending it is a total nightmare, especially with dark hair, and it just makes me look like I’ve experienced premature aging. In the bottle, the citrusy smell of the dry shampoo is quite strong but still pleasant. In reality, it doesn’t scent my hair at all. Maybe it just didn’t work for me because I’ve got naturally thick hair, but I’ll definitely be sticking with drug store aerosols for dry shampoos. I was a little afraid to use this one because rose scents that aren’t done well always smell like the elderly. As always, Lush took a strong floral smell and softened it up with vanilla to give fantastic results. It lathers up really well and smells like a soap that would be too fancy to come out of a plastic bottle. The fragrance lasts for hours and moisturizes the skin extremely well. The only downside to this shower gel is that it’s limited edition and can only be found around Christmastime in December. Come on Lush. This cuticle butter is chock full of rich ingredients like mango butter, avocado oil and primarily lemon, to moisturize and brighten cuticles. A little goes a long way with this product, so my tub of cuticle butter is still nearly full. I try to remember to use it after I’ve pushed my cuticles down to soothe the agitated nail beds. It definitely prevents cracking cuticles and makes a manicure look much cleaner. I forget to moisturize my body all the time, so I definitely didn’t use Lemony Flutter as often as I should’ve to get it’s full benefits. I probably wouldn’t repurchase it, but I enjoy pampering my hands with it every now and then. I’m a real sucker for a raunchy name and a jasmine scent. Silky Underwear is a moisturizing dusting powder that’s supposed to soak up excess oils from the skin. A YouTube beauty guru claimed to use it after workouts to refresh all body parts, and so I was intrigued enough to buy it. I absolutely love the jasmine and cocoa butter-y smell to it and wish I could find a perfume exactly like it. While it does fulfill its promise of leaving skin feeling silky, I found that it doesn’t settle into tanned skin well. It’s also a hassle to apply and I usually end up spilling powder all over the floor. I’m not one to joke about drugs, but seriously white powder was everywhere. It actually works better as a dry shampoo than No Drought did, and leaves hair smelling faintly of jasmine. But if you’re looking for moisture, stick with lotions. This dusting powder is a fun luxury to end a spa night with, but definitely not worth the time and effort it requires on a daily basis. I’m a huge fan of Lush’s perfume sticks. I love that it smells different on everyone and is so portable to apply throughout the day. After buying the Lust perfume stick four times, I thought it might be time to switch things up. Karma is one of Lush’s most popular scents so I gave it a try. At first, I felt like I smelled like a spicy orange and hated it right away. I warmed up to Karma once it mixed with my perfume and smelled more like a unique soap than a seasoned fruit. I haven’t decided whether I’ll repurchase it, but I’ve been enjoying it more and more lately. You can cut bath bombs in half so that they last longer. You still get the scent, colour and silkiness in the water. It’s just the thought of baths in general that I’m not too fond of. But I love going into Lush and smelling all of them. They’re so creative with the colours and names, just like the rest of their products! To be honest, I don’t really like lush. I think it’s because they pose themselves as a natural company when looking at the ingredients list they are anything but. Also, as you mentioned it is awfully expensive!